The Family Holiday Association not only improves access to breaks for struggling families, but over the years the charity has acted as a champion of social tourism, supporting research, working with partners and reinforcing both the social and economic value of social tourism. Previously, the charity has supported the All Party Parliamentary Group’s Social Tourism report, Giving Britain a Break, that was put together back in 2011 under the auspices of the Chairman, Paul Maynard MP. However, the time has come for more awareness on social tourism, and this was the reason for the round table that took place back in April. The meeting heard from a number of different groups that have come on board with social tourism since 2011 and have done some amazing work. You can read the report from the meeting in Westminster here, or read about the key issues that were raised below. A technology platform where professionals working with families can access offers uploaded by tourism and attraction businesses was considered a key deliverable. The challenges facing this proposition relate to reach and resource – whether a national platform could be created and how much funding this would need. It was noted that various stakeholders were promoting different aspects or benefits of the social tourism concept. Contributors agreed that a single narrative was needed to unite all parties behind clear messages to take to policy-makers. These could be supported by complementary messaging and information. Of the political issues discussed, the importance of family welfare, children’s life chances and strengthening social justice were identified as important narrative themes. Such a narrative also needs to be shaped with the interests of tourism businesses in mind, and must be appealing to their commercial considerations. Despite the wide-ranging support for social tourism initiatives and evidence of its benefits, it was acknowledged that more progress needed to be made in getting the concept on the radar of the Government in Westminster. It was noted that complications arose from social tourism activities and benefits coming under the remit of a range of departments – Education, Culture, Media and Sport and Work and Pensions. 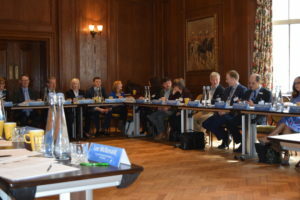 Contributors agreed that a compelling social and economic case needed to be presented to ministers along with a strong narrative and messaging. The inter-ministerial group for tourism and the Cabinet Committee on social justice were identified as important gatherings of ministers to approach.